If you’re going to really dress up your house with an elegant door, you need to make certain that it’s actually secure. While it may seem obvious, most people don’t think about the fact that a burglar or another intruder is most likely to enter your home through the front door. Unfortunately, many people leave their doors unlocked and a lot of burglaries are committed by people who just walked right in. A professional door installer can’t stay around to make certain that you lock your door, but they can do other things to ensure that your home is as secure as possible. A professionally installed door swings smoothly and is very secure. The hinges will be installed with both appearances and security in mind. The lock will lock securely and any bolts installed on it will throw properly. These things make all the difference. According to burglars themselves, the first thing they’re going to do is check to see if the door is open. Failing that, they’re going to look for a key hidden somewhere, which should tell you exactly how dangerous it is to hide a key anywhere in your yard. The third thing is where professional door installation comes in. The burglar is likely to kick or use a crowbar on your door to see if it opens. They’ll try this for about a minute. If they can’t open that door in a minute, they’re going to look elsewhere. 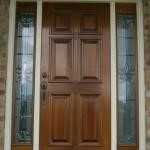 A professionally installed door will carry out its security functions very well. People who install their own doors may leave gaps in them or they may simply fail to install it correctly in terms of how the bolts throw, which makes it shockingly easy for somebody to stick a crowbar between the door and the frame to just pry it right open. What you want is that door that takes more than a minute to get open with a crowbar, and professional installers can help you with that. If you’re particularly worried about break-ins, look at security door enhancements or very heavy doors. A door installation company can go over your options with you and let you know which items would suit your needs the best. Your home truly is your castle. With the right door, it will not only look as beautiful and formidable as a castle, it will actually live up to how it looks. Call Doors of Elegance today to find out how our door security professionals can help your home be both beautiful and secure, (504) 887-5447.